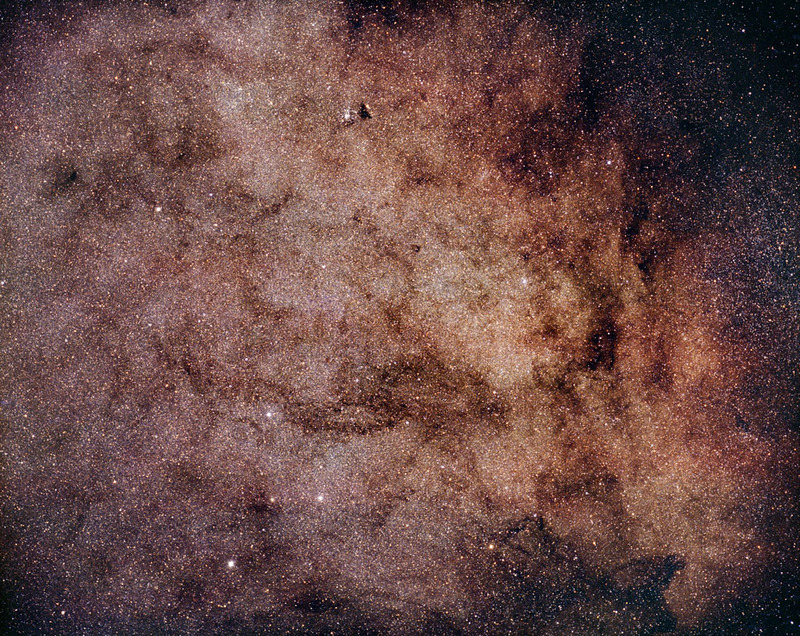 The Sagittarius Star Cloud is the brightest part of the Milky Way, near the galactic center. It is northwest of the Sagittarius "teapot spout". This image is full frame and covers 4.6° x 3.6°, centered at about 18h -29°. North is up. The bright star at lower left is Alnasl (y2). Globular cluster NGC 6522 is located in Baade's Window and is 25,000 light years away. RegiStar counts over 185,000 stars in this image. The obscure globular cluster Djorgovski 2 is indicated by the magenta arrow. Dj2 is a small loose yellow GC, discovered in 1987. This image was used as the July image of the 2003 RASC Observer's Calendar.